HUMBOLDT PARK — Mayor Rahm Emanuel stopped in to the Humboldt Park Library to tour the newly renovated library and new youth media center. The library, 1605 N. Troy St., reopened Feb. 9 after being closed for nearly a year to renovate the building and add 5,000 square feet for a youth media center and 35 new computers. Emanuel was scheduled to appear for a ribbon cutting on that day, but canceled so he could attend the funeral of slain teen Hadiya Pendleton. Nearly a month later, the mayor finally got a chance Wednesday afternoon to tour the $4.5 million addition, which was built to LEED standards with a rain-harvesting system for irrigation and a new parking lot made of permeable pavers. It was the first major renovation for the library since it was built in 1996, making the library a third larger at 18,000 square feet. Emanuel was joined by Ald. Roberto Maldonado (26th) and Chicago Public Library Commissioner Brian Bannon to talk about the expansion. 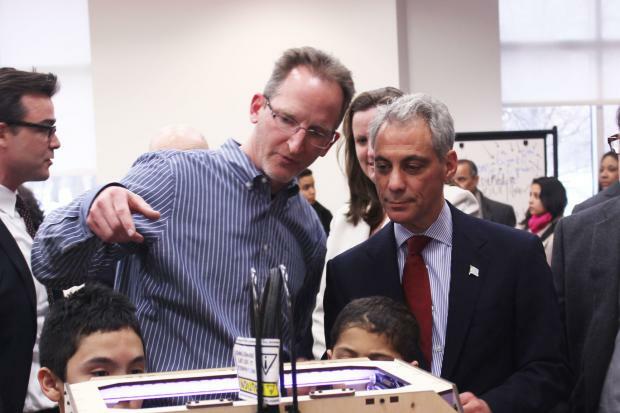 "I'm very proud that in one of our neighborhood libraries is literally the cutting edge technology that will now, as we open additional neighborhood libraries through the city, be the template that everybody will copy," Emanuel said. In total, the library will have 47 computers for public use and four laptops available for patrons to check out and use in the library, library officials said. The new YOUMedia center, sponsored by Motorola and Boeing, also boasts a 3D printer on loan through Northwestern University's STEM Education outreach program. The mayor praised the expansion as an opportunity for children to learn about new technology as well as a stimulating place where kids can continue to learn after school hours. "This is a community center throughout," he said. "Yes, it's focused on our children, but it's also making sure the parents of the children know there's a safe place for the kids to learn, to experiment, to literally get hands-on instruction in the most important technology."